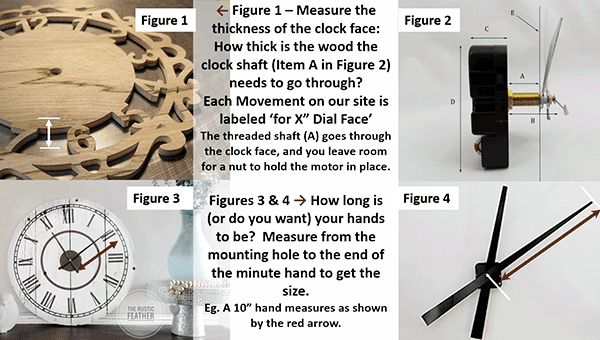 Clock hands are free with the purchase of our clock movements - or $1.50 per set. High Torque Clock Motors are more powerful than standard/mini motors - made specifically to handle the extra weight of longer clock hands up to 18" in length. 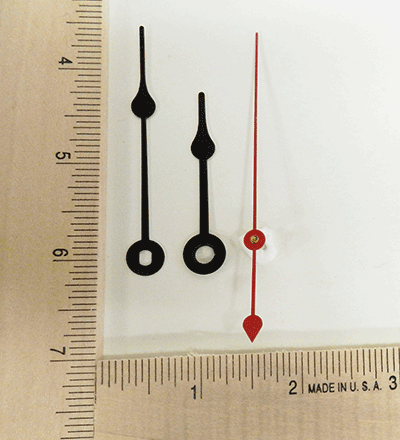 Standard/Mini movements run clock hands less than 5 inches long. Tip 1) If your material is too thick, consider removing some to in-set the clock. Or if your clock face material is too thin, consider adding some material behind the face so the hands will sit closer to your clock face. Tip 2) Most hands can be slightly trimmed if need be. Tip 3) Our customers also spray paint them. They arrived in perfect condition. I was concerned, being a delicate item, them may arrive bent. These are extra hands purchased for my daily wind up pendulum clock. The design is great. Order was correct, delivered quickly, and packed properly. I look forward to further business in the future.